Chapters 4 and 5 above have shown you how you can make your searches more precise by either selecting a limited search scope or by refining your search terms with advanced operators before you submit your query. In this chapter we will discuss on how you can filter and reorder your results after a query has been executed. Whenever you execute a search on the Portal, you can use the facets shown on the right-hand side of your screen to filter your results according to one or several dimensions. Filtering can be changed at will: Once you have applied a set of filters, you can remove one or several of the applied filters again, or apply additional filters, until you are satisfied with the results. Language of description: only return descriptions written in the specified language(s). Item type: only return descriptions of a certain type (i.e. country reports, archival institutions, archival descriptions). 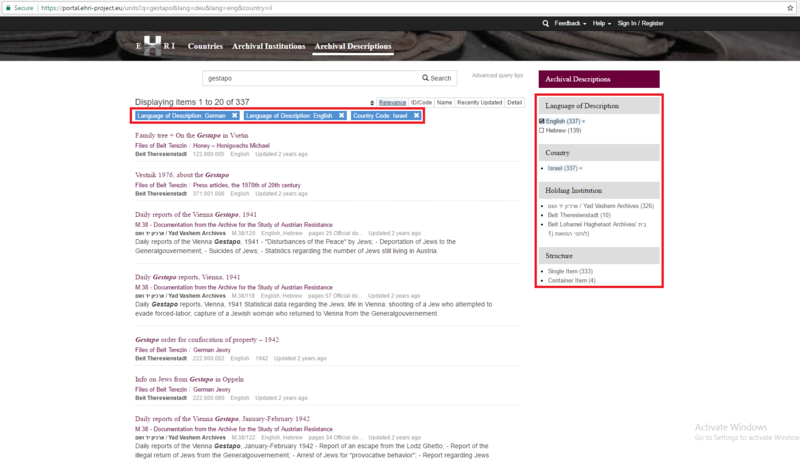 Catalogued material available: only returns reports of countries for which descriptions of archival institutions are available in the Portal. Country: only returns descriptions of archival institutions that are located in the specified country. 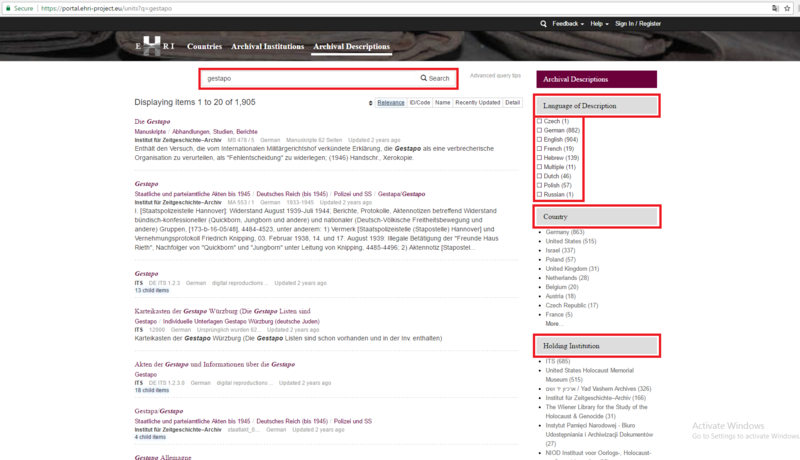 Catalogued material available: only returns descriptions of archival institutions for which descriptions of archival holdings are available in the Portal. Language of description: only return descriptions of archival holdings written in the specified language(s). Please note that this filter applies to the language in which the description is written, the described archival holding my well be written in a different language. Country: only returns descriptions of archival holdings that are located in the specified country. Holding institution: only returns descriptions of archival holdings held by the specified institution. Structure: only return descriptions of archival holding that are either a single item or a container for other items. A container item would, for instance, be a collection-level description that contains one or several record-level descriptions. As already explained in Chapter 4 above, once you have executed a query, the results list is by default sorted by “relevance” - i.e. by the extent to which the search engine determines a given item to be relevant to your search terms. In most cases such an ordering by relevance will offer you the best result, but there may be occasions where a different ordering might be more useful. You can change the default sort order by clicking on one of the five options highlighted in the screenshot below. ID/Code: this sorts ascending according to the codes by which items are identified in the portal. For countries this identifier is a two letter country code; for archival institutions a (random) six digit number; for archival descriptions the local identifier used by the holding institution to uniquely identify the given holding. Recently updated: Using this order, those items are shown on top whose descriptions have been most recently added and/or updated in the Portal. Choosing this order can be useful if you want to check whether additional items have been added to the portal (or existing items updated) since you last executed your query. 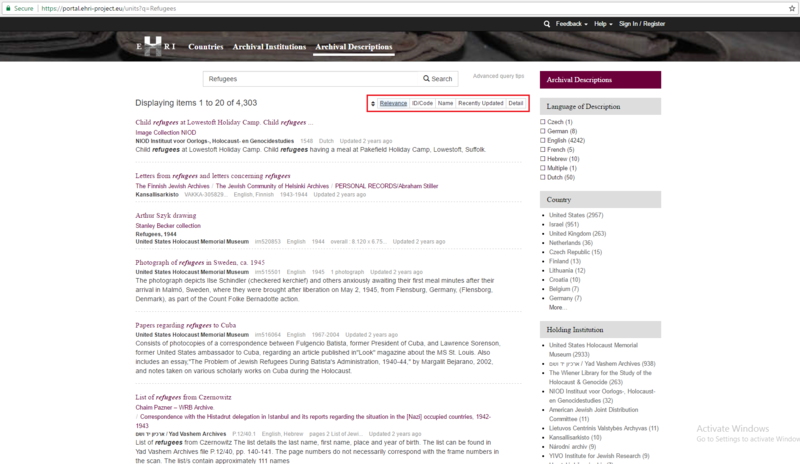 Detail: This moves long, detailed descriptions towards the top of the result list.